When you write music do you find yourself not being able to finish your idea? Perhaps the initial idea became something else or you got distracted by something around you? You might not actually have ADHD but It’s a pretty common problem these days and I’m not sure if that has to do with our limited attention span people keep telling us we have. ADHD, short attention span or not, being able to stay focused and finish the work at hand is important. It will create less clutter from folders with unfinished music and unfinished mixes. It will also let you pitch more music to publishers or labels, get more fans and listeners. So, what can you do to combat a cluttered mind? However, if you think about it, it makes sense. It can be worth thinking about some of these questions when we sit down to make music. For example, for you to be able to stay focused and do the work, what can you control to make that happen? Turn off your phone, wifi, the mail app? Or, why not just stop going on the internet altogether? This is what the author of Confession of a Teenage Gamer, Nicolas Cole, did for about 4 years to write his book. Now, 4 years is a long time without the internet. But it must have cleared all the distractions he could have had. Check Cole’s article, 10 Ways To Stay Ridiculously Focused On Your Goals, for some more tips from the man himself. What could you accomplish if you took a break from the internet for 4 years? This is a personal favourite of mine because you want to make your work as easy as possible. You don’t want to have to go through all the pain with setting up a new session, creating tracks, routing things, etc., which can cause you to lose your focus when you just want to lay down some new ideas. The solutions for this is to have templates ready. For example, I have a few templates (for mixing and writing) and for my current writing project, I have created a template which I can just open up and start making music within a few seconds. In it, I have my instrument-tracks such as drums, synths and a few tracks for guitars. This is all I need to be able to make music but it saves me probably 5-10 minutes every time I open a new session. 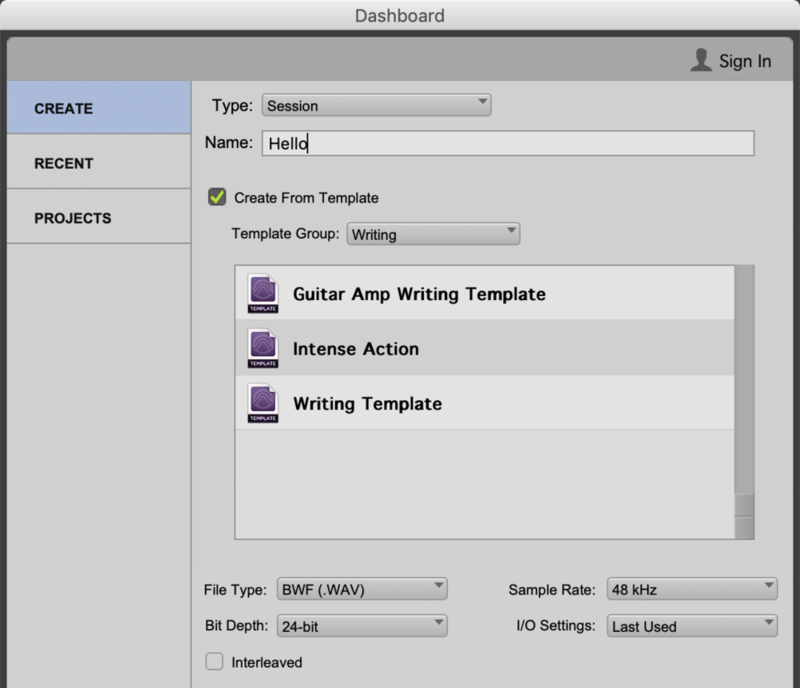 My Pro Tools writing templates, what do you call yours? Being organised and having priorities can also help you stay focused on what’s at hand. For example, if you have a lot to do, perhaps sending emails, mixing for a client, write your own music, etc., it’s easy to jump between tasks and not complete one task at a time. This can leave you feeling even more stressed because the tasks you have set out to do never get finished. By writing down what you have to do for the day, or for the week ahead (my recommendation), you can easily follow what you have to do and check the box for “complete” when you are done. This will help you stay more focused and feeling less rushed because you have a plan and a system for how to complete your tasks. Now, let me know if this is something that is bothering you or if you have any other solutions for this problem in the comments below! Having worked in many recording studios in London and talking to people in the music industry, working 12-14 hour days is very common. However, is this necessary to succeed or is much of it down to fear? The fear I’m talking about is the perceived fear that if you are not working around the clock you might be risking losing clients, losing money, not being able to meet deadlines and missing opportunities. The fear of it all stopping where no one calls you anymore might also be a big fear factor that drives you to work around the clock. But, again, is working more hours the answer and the right preventive to stay ahead of the fear and the competition? You have to, both emotionally and intellectually, maintain a balance which can be very hard when bills are pressing or problems are brewing. However, relationships are very important, such as family or significant others, but it often gets overlooked. Having worked in this environment I don’t see any benefits of working around the clock all the time. And, as Herb stated, it can also affect people’s personal lives, which, I believe is important if you want to sustain a long career in music. Why can’t you have a great career working “only” 8-hour days, 5 days a week? Or, half that, 4-hour days, 3 days a week? As Tim Ferriss stated: What if you did the opposite? I believe if you work smarter and harder, harder being to stay away from distractions (like Facebook and Instagram) and only doing one thing at the time, you can achieve great results too. I know I have. Without coming across as a Tim Ferriss fan girl, but his comment about setting tighter deadlines can be worth thinking about and help you accomplish more in less hours. Since we have eight hours to fill, we fill eight hours. If we had 15, we would fill 15. Basically, the more hours you give yourself to complete a task, you will most likely use those hours. Instead, if you give yourself less hours and a tighter deadline, you can accomplish what you set out to do in a shorter space of time. Let me know in the comments below what you think about this. why do you think people are workaholics and does working more hours mean you will succeed?